Berries are small, pulpy, and edible fruits. Berries are usually juicy, rounded, brightly colored, and sweet or sour, and do not have a stone or pit, although many pips or seeds may be present. Berries are eaten worldwide and often used in jams, preserves, cakes or pies. The market is witnessing an increase in demand for organic berries, after a long time rule of conventional berries. Organic berries are free from synthetic additives such as pesticides, chemical fertilizers, and dyes. They are not processed under industrial solvents, irradiation, or genetic engineering and the content is 95% or more certified organic. The remaining 5% can only be foods processed with additives from an approved list. The growing consciousness among people regarding their health is making them more inclined towards organic berries. The current market trends indicate that the berries market is surging with an increase in the application areas. Berries are commonly used as dietary food or functional ingredients; these fruits are also used for natural food coloring, natural food flavoring, and other purposes as well. Natural food color or natural food flavor with nutrients are considered to be premium quality food ingredients. Hence, increasing preference for multi-use food ingredients translates in driving the revenue of the global berries market. For instance, cranberry is often used as food coloring worldwide. Among the major application areas of berries, food and beverage emerges as a leader. The food and beverage industry depicts the highest demand for berries as compared to other industries like pharmaceutical, cosmetics etc. 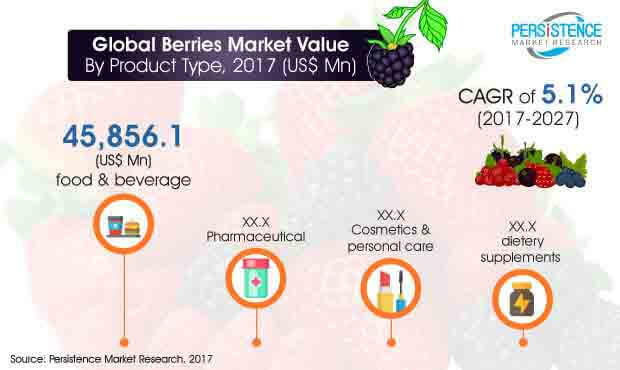 The market size of the food and beverage industry in the global berries market is expected to reach a value of over US$ 70,000 Mn by the end of 2027, growing at a CAGR of 5.4% during the forecast period. Also, among the sub segments of food and beverages, beverage is a dominating sector in the global berries market and is expected to hold the highest market size by the end of 2027. Berries are rich in antioxidants and have many health benefits; for instance, berries increase the antioxidant levels and reduce the risk of metabolic diseases including obesity and diabetes. Natural antioxidant sales is anticipated to grow at around 5% CAGR during the next five forecast years. Also, antioxidants have an increasing demand from the food and beverage industry, which is attributed to the increasing application in energy drinks and bars and powders; consequently the manufacturers of berries are experiencing significant demand across the food and beverage and cosmetic industries. Such energy drinks are experiencing a surge in their consumer base. People are growing fond of RTD (Ready to drink) and RTE (Ready to eat) products. Different flavours for food and beverages and nutritional benefits of berries are the most appealing and influencing factors that translate to increased demand from RTE and RTD products worldwide.